To make the wonton mixture, mix the chopped prawn meat together with other ingredients. Lay out a wonton skin and place a heaped teaspoon of prawn mixture into the centre. Brush the edges of the top half of the wrapper with water and fold the bottom up to meet with the top edge. Run your finger over the filling to push out any air bubbles, then press the pastry firmly around the meat so you have a sealed parcel. 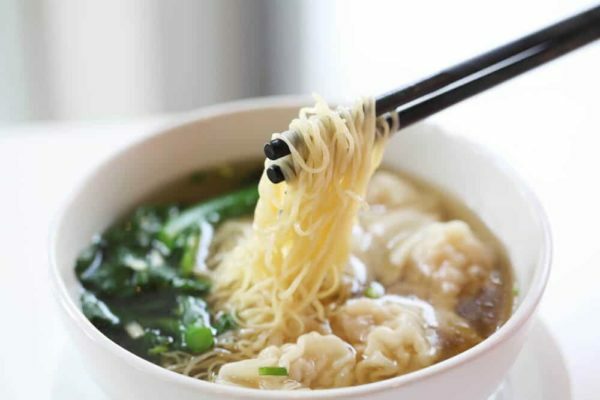 Place the wonton aside and repeat with the remaining wonton skins. To make the soup, heat the chicken stock in a pan over medium heat. When it comes to a simmer, add soy sauce, ginger and spring onions then reduce the heat to a very gentle simmer. Add a pinch of ground white pepper. Gently cook the wontons for about 3 minutes in a separate pot of simmering water until just soft. When the dumplings float to the top, they are cooked. Remove from the water and divide between 4 large bowls. Divide the noodles and bok choy between the 4 bowls and pour over the seasoned stock. Serve immediately.